A fallen branch damaged the restroom on the north side of the park at Lodi Lake in Lodi Wednesday, April 10, 2019. 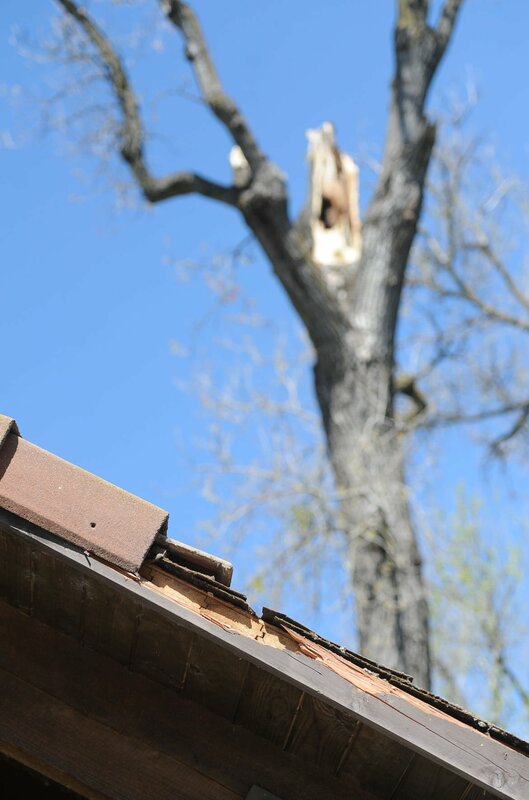 A large branch from a cottonwood tree fell on the roof of the north restroom at Lodi Lake on Tuesday afternoon as wind gusts reached a peak of 37 miles per hour in the area, according to the National Weather Service. The damage to the roof is estimated at $1,000, according to Lodi Parks, Recreation and Cultural Services Director Jeff Hood. “The roofing tiles and the wood elements beneath the tile will need to be replaced,” Hood said. The damage was first discovered Tuesday evening by a park officer and no one is believed to have been injured at the time of incident, Hood said. “Once wind speeds reach 20 miles per hour we close the entry gate to the lake. Although the lake is not locked, we hope people will see the closed gates and not enter the lake,” Hood said. The city has closely monitored wind speeds and weather reports in an effort to prevent any accidents at the park. Wind speeds and tree health have been addressed previously by city staff following the discovery of toppled trees in the lake’s nature area this past winter. “This was the first time we witnessed something like this happen in the main part of the park,” Hood said. Parks staff has made an effort to trim and remove trees that are believed to be rotted or dead, to thwart the risk of more trees falling on lake property. Although wind speeds subsided yesterday evening, they are expected to pick up this afternoon into Friday morning, according to Carl Erickson, a meteorologist with the private forecasting firm AccuWeather. People should be cautious and alert as wind speeds are expected to rise. The high winds have led to the San Joaquin Valley Air Pollution Control District issuing an advisory recommending people with heart or lung disease to avoid extended exposure outdoors. Wind speeds are expected to slow down to about 20 to 25 mph around midnight on Friday. “The weekend will be sunny and clear with wind gusts hovering around 20 mph,” Erickson said.